K-9 officer Chase has earned laudits as an “amazing addition” to the Town of Haverstraw Police Department and now he’ll have better medical support available should he need it. 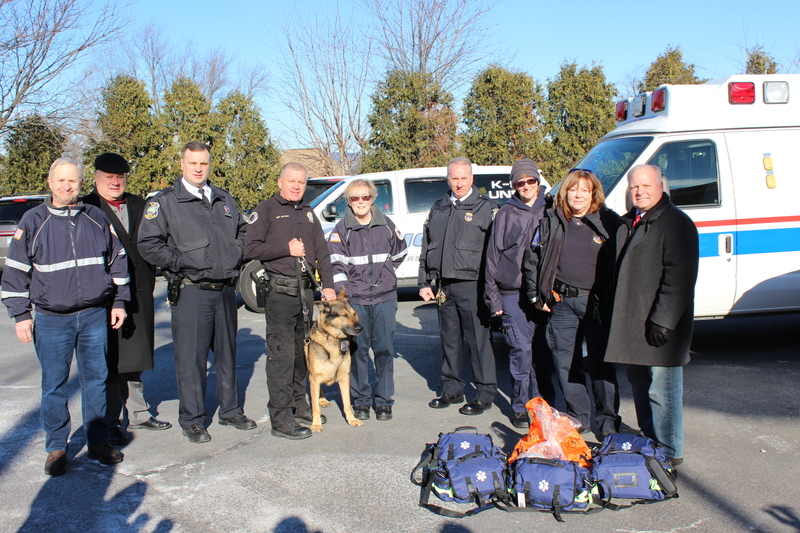 Haverstraw EMS announced on Wednesday that it will now carry K-9 first response kits on all three local ambulances. Haverstraw EMS has assembled one to be provided to and carried by Rockland Mobile Cares Medic-1, the Paramedic Unit that covers the area. These kits will carry many of the necessary supplies including Narcan, to render immediate care to Officer Chase or other K-9 officers, in an emergent situation. Additionally Haverstraw EMS announced that the service will be providing Medic-1 and Detective Gaynor, Chase’s handler, pet oxygen masks in the event the delivery of oxygen is required. These masks are designed to fit over the “snout” of the K-9 in an effort to deliver the appropriate, most effective amount of oxygen if needed. Recent approval by the State of New York allows ambulances to transport K-9 members of service to an emergency animal hospital for treatment if required and having equipment designed specifically for them is an asset. Haverstraw EMS also reached out to help less fortunate dogs housed at Hi Tor Aninal Shelter and held a collection drive for many items needed at the shelter. Haverstraw EMS donated eight bins of food, bedding and needed supplies to Hi Tor on Wednesday. Haverstraw EMS, also referred to as Haverstraw Ambulance Corps. is located at 160 North Route 9W, Haverstraw.